By 5 p.m. Friday, the blue sky hanging over Bicentennial Park was filled with pink balloons. It was a somber event to mark the death of longtime Boulder City resident and dance instructor Amy Arnaz, who lost her battle with brain cancer in January. She was 63. 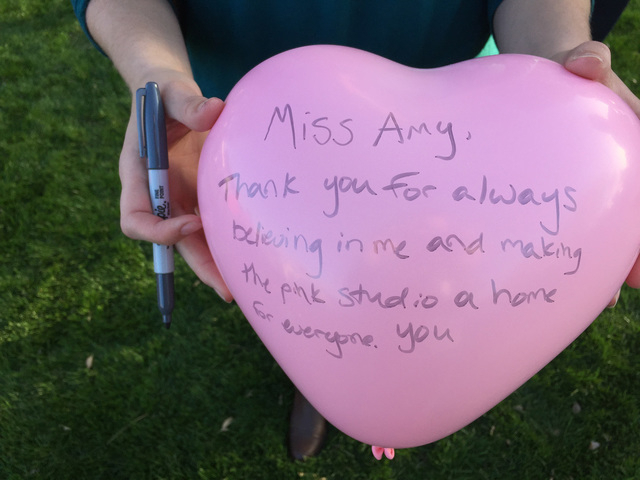 Mourners gathered to celebrate the woman they remembered as “Miss Amy” as they released hundreds of pink, heart-shaped balloons into the cornflower blue sky. Most wrote messages on their balloons, including Greg Radig, a friend of Arnaz whose pink balloon had “See you in heaven Miss Amy” written on it. As friends and family cried and laughed while sharing memories of Arnaz, others lined up to sign the 6-foot-long banner that had her picture on the left of it and the words “Keep Dancing and Love” on the right. Kirk, who was 3 years old when she first started dancing at Arnaz’s studio, said Miss Amy pointed out each detail while producing a recital. Kirk grew up in Boulder City, but now lives in Henderson, and she volunteers at community theaters around the Las Vegas Valley. Jayme Server, who dances in Disneyland’s “Mickey’s Soundsational Parade,” said Arnaz always made everyone feel comfortable inside her studio. Like Kirk and so many other girls, Server began taking dancing lessons from Arnaz when she was 3. 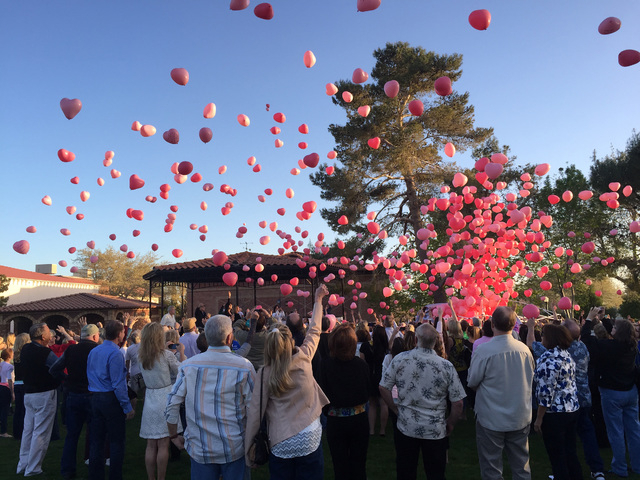 As 5 p.m. approached, Arnaz’s daughter, Haley Arnaz, counted to three, and hundreds of pink balloons drifted into the cloudless afternoon. Haley Arnaz and Bargiel recalled some of Arnaz’s tendencies, which quickly turned their tears to laughter as they remembered the way she walked, talked and dressed. “She always wore a long skirt with a tight belt. She had a beautiful sweater and her hair was always perfect,” Bargiel said. “An outfit wasn’t complete unless lipstick was there. It was the cherry on top,” Haley Arnaz added. 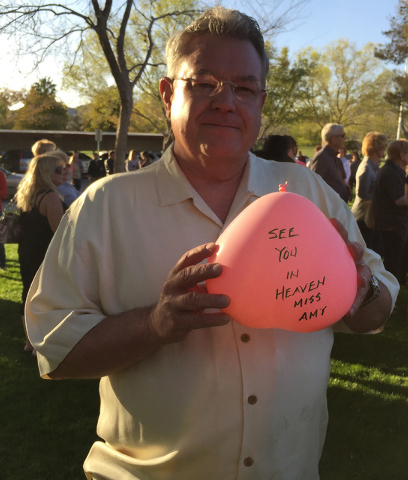 After the balloon release, those in attendance made their way to the Boulder Theatre where Desi Arnaz Jr. showed the tribute he made for his late wife. The video, which he began working on two years ago, featured a montage of various recitals, family photos, and a compilation of both cheerful and somber music. The audience inside the theater was quickly brought to tears during the 20-minute video when Miss Amy spoke. It was the familiar voice they missed so much. “She was magical. It’s great that we get to remember her for who she was,” former dance student Sarah Dey said.